I actually get questions from people about vegetables a lot, even at the grocery store. On more than one occasion, the cashier has asked me what a produce item is (just for the purposes of looking up the code for it), but then gone as far as to ask me how I cook it. I always find it a little unnerving to answer the question right on the spot, but I’ve realized that there are just a lot of people who are just curious what to do with certain fruits and vegetables. Now, I’m not claiming to be an expert on anything (persimmons still remain a mystery to me), but my mother was the kind of adventurous eater that made me excited to try new things. The fact that she sometimes made it seem like we were hiding something from my dad (a notoriously picky, boring eater) made it all the more intriguing. Artichokes and pomegranates are fun to eat, but a lot more fun when it seems like you are doing it on the sly. So, here now is a series dedicated to fruits and vegetables (“How do you…”). Some will be ordinary to you, some might be unfamiliar. It is the great thing about the world wide web – there are a billions of perspectives for each post. Gonna start with collard greens. 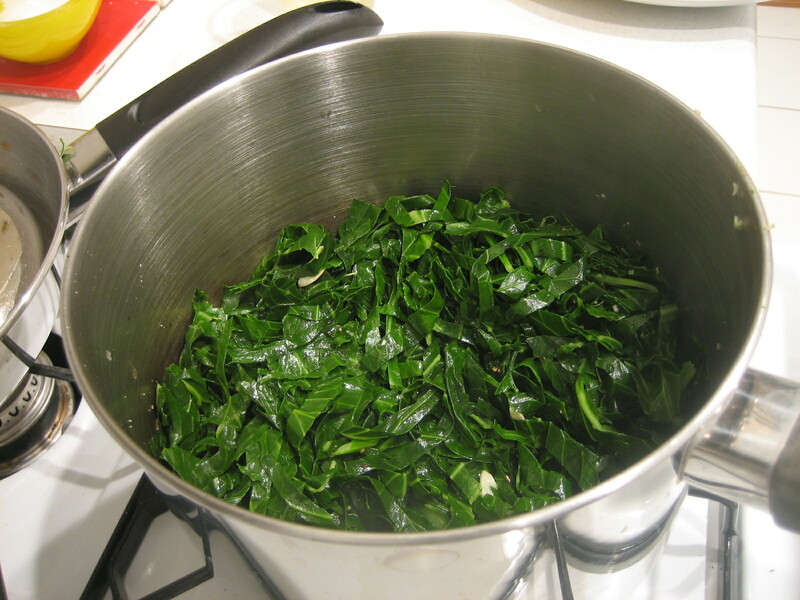 Now, I never really ate collard greens as a kid, but when I did, it was in the south and they were simmered for a long time along with some kind of smoked meat, and most often seasoned with hot sauce to taste. They were good. Really good. However, I don’t usually have the foresight to plan a day-long cooking process for dinner, unless it is a weekend or a special event. Through some recipe research (and trial and error), I figured out a way to make quick, tasty collard greens in two versions – one vegetarian and one omnivorous. 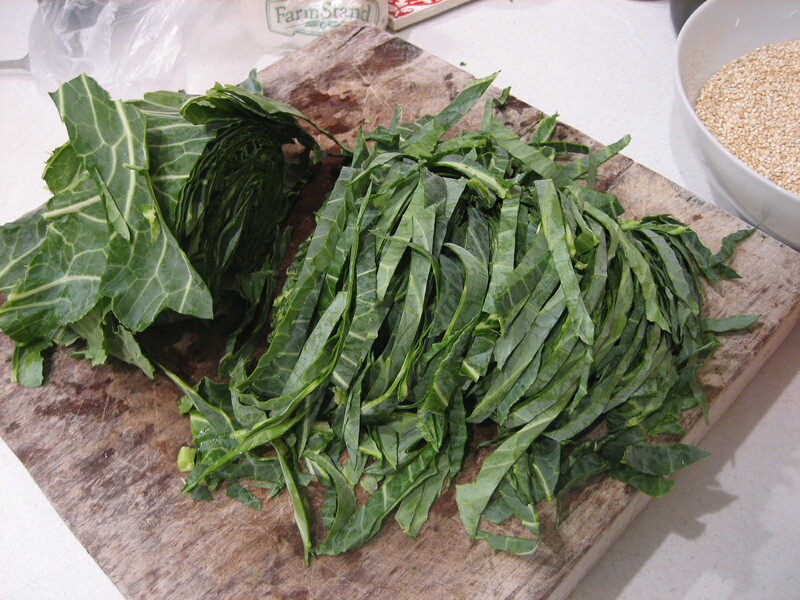 Again, when you make collards in the southern style, you just tear the leaves and don’t need to slice them so thinly, since they cook for so long. You want thin slices for this new version, since the cooking time is so short. Once you have the leaves all sliced, place them into a colander and rinse thoroughly with cold water – many greens, especially those from farmer’s markets, tend to be rather dirty. Once clean, heat a deep pot large enough to hold all the greens on medium high with a few tablespoons of olive thrown in. I love your writing so much. 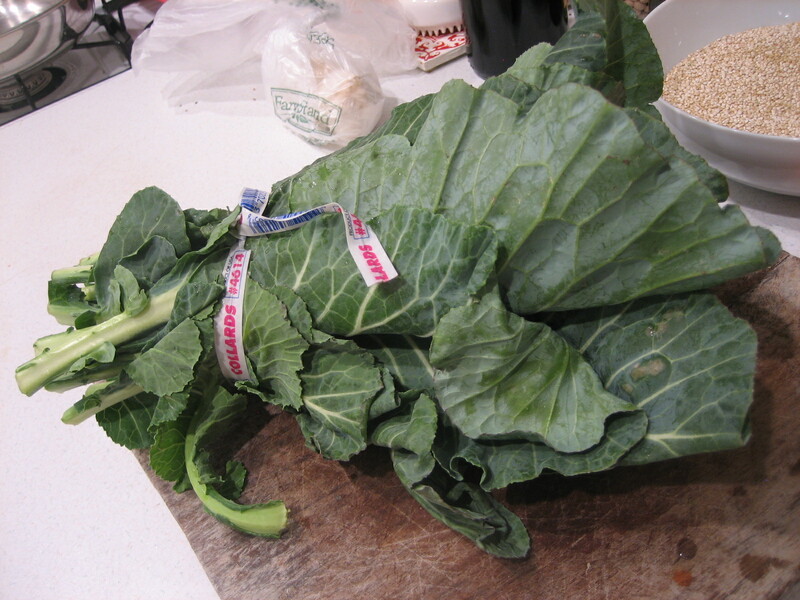 Have you ever steamed collards in a pan of shallow water and used them as tortillas? You have to do it one at a time but they make really sturdy yet pliable substitutes for carby tortillas.